The 12th edition of IPL is just two weeks away. The opening match on March 23 will see defending champions Chennai Super Kings taking on Royal Challengers Bangalore. Last year, riding on some excellent performances from the experienced players, CSK lifted the title for the third time as they made a successful return to IPL after serving two years ban. This year, the Chennai based franchise will again be one of the strongest contenders to win the trophy. Barring Mark Wood, CSK have retained all their players from last season. Led by MS Dhoni and coached by Stephen Flemings, CSK’s historic strength has been the depth in their bowling department. Over the years, several star bowlers viz Muttiah Muralidharan, Makhaya Ntini have donned CSK jersey. This year also they have a strong bowling lineup. In this article, we will shed a light on 3 key bowlers who can help CSK in retaining the trophy. The T20 era has seen a return of the craft of wrist-spin. They are in vogue as they can turn the ball both ways. Batsmen often, due to volatile match scenario, don’t read the trajectory out of their hand which helps wrist-spinners in transcending the big bats, flat pitches and small boundaries. South African Imran Tahir is one such wrist-spinner in T20 landscape who has troubled the batsmen across the world. 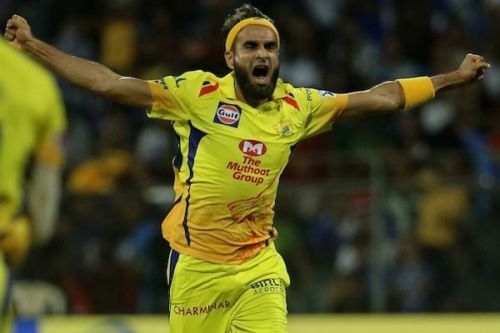 Tahir has been retained by CSK for 12th edition and will play a pivotal role during middle-overs. Like modern leg-spinners, he bowls quicker in the air – in excess of 90 km/h – and doesn’t give batsman any breathing space. In 37 T20Is for South Africa, the 39-year-old veteran has picked up 62 wickets at an economy of just 6.77 including two five-wicket hauls. If Tahir shines, oppositions will have their task cut out.